Although Nessie was sighted as far back as the 6th century a.d. it is the modern day sightings that have captured the public imagination. In the early part of the 1930's a new road was built around Loch Ness which in turn brought in a spate of new sightings from road users and sightseers. Up until this time stories of the monster circulated more within the local community but talk of other sightings were spreading outwith the village. The first recorded sighting of Nessie on land was made by Mr Spicer and his wife, on July 22nd 1933, who were driving down the road between the Loch Ness side villages of Dores and Inverfarigaig. They caught sight of a large cumbersome animal crossing the road ahead, which was some 20 yards from the water. They first saw a long neck, forming a number of arches, a little thicker than a elephant's trunk and a huge lumbering body heading towards the Loch. It disappeared into the bushes out of sight. After this sighting reports flooded in and interest grew on an international scale. Speculators offered huge prizes for the animal, dead or alive. 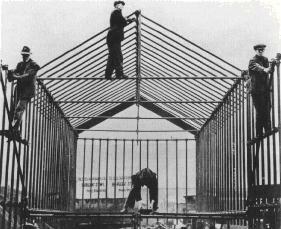 Circus owner Bertram Mills promised a sum of £20,000 to any man who could bring the creature alive to his circus. Probably one of the first photographs to be taken of the monster was snapped by a British Aluminium Company worker, Mr Hugh Gray, near Foyers. It showed a writhing creature creating a considerable disturbance on the surface of the Loch. He only saw part of the animal which he estimated to be around40 ft long, which included a thick rounded back and also a muscular looking tail. In December of the same year a hippo's foot had been planted by a prankster and all was taken seriously until officials finally uncovered the truth. This had an affect on future reports of sightings, as theywere taken less seriously.But still reported sightings were becoming increasingly common and more intriguing. On the 5th of January, 1934, a motorcyclist almost collided with the monster as he was returning home from Inverness. It was around 1a.m. and was bright due to the moonlight. As Mr Grant approached Abriachan on the north-eastern shore of the Loch he saw a large shape loom on the right side of the road.As he approached the object he saw a small head attached to a long neck.The animal saw Grant and promptly crossed the road back down to the Loch. Mr Grant, by this time, had jumped off his motorbike and followed the path it took to the Loch only to see the rippling water where thecreature had entered.In April,1934 the most famous photograph was obtained by a London surgeon as he heading towards Inverness along the new road. The Surgeon's picture. There is some dispute as to the authenticity of this photograph. This event encouraged more people to come forward with their tales of sightings. An event on the 5th of June, 1934 was considered to be of importance but was not widely publicised. It involved a young girl from the Fort Augustus area who was employed as a maid in a large house close to abbey. It was about 6:30 a.m., the maid was looking out of a window down the Loch. She saw on the shore, ' one of the biggest animals she had seen in her life, ' at a range of about 200 yards. Her description was similar to those of others, giraffe like neck, small head, skin like an elephant and two very short fore legs or flippers. She watched it for around 20 mins when it re-entered the water and disappeared. There were a number of privately funded investigations, most of which were not successful, which took place in the same year. There was one such expedition which did have a degree of success. It was led by a Sir Edward Mountain in July, 1934. During that period of research and investigation he obtained five still pictures of the monster, he had observed the monster, along with members of his team, and had actually filmed the monster. It was probably because the expedition was so well funded that a result was most likely and that a poorly funded investigation would be doomed to failure. As the threat of war with Germany grew stronger, Nessie and all the sightings were furthest things from peoples minds, but there were some recorded sightings and even a number of photographs were taken. 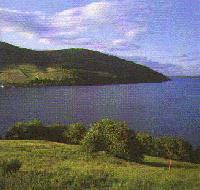 During the war Loch Ness was in control of the Navy and the loch area was secured. This did not stop the monster from making itself known.In May, 1943, a Mr C.B. Farrel of the Royal Observer Corps was on duty to warn of incoming enemy bombers but instead observed the movements of the monster at a distance of 250 yards. He saw 20-30 ft of the monster's body and the neck which was approximately 4-5ft above the surface of the water. The eyes, he explained, were large and the body of the monster appeared to have a 'fin'. It finally submerged without a movement on the water.